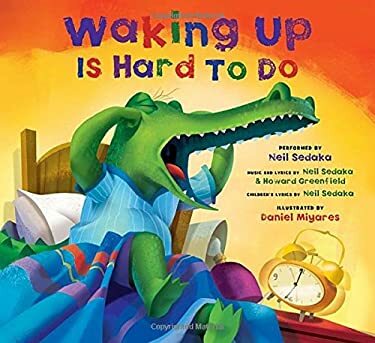 "One of the most popular songs in music history becomes one of the most delightful children's books ever--complete with a CD featuring two completely new tunes by NEIL SEDAKA "
Rise and shine It's morning time. The alarm clock's ringing, the birds are singing. Everything's saying: get up, get going Breakfast is warming, school is calling. The streets are bustling, all the world is stirring. But does it seem so hard to you? Is waking up very hard to do? Come on, sleepyhead: get out of bed Brush your teeth. Comb your hair. The minutes are passing. Don't be late; the school bus won't wait It's sure to be a happy day with this bright and sunny picture book and CD, with new lyrics based on the hit song by Neil Sedaka and Howard Greenfield. Daniel Miyares's delightful art opens the eyes with its vivid colors, playful details, and adorable collection of animal characters. And to make waking up just a little easier, there's a CD with Neil Sedaka singing this happy song, plus two new songs with lyrics and music by Neil written especially for this CD: LIGHTNIN' JIM and SING. Warm and friendly and full of fun, this is a musical and visual celebration of the everyday joys of home, family, and neighborhood. "Waking Up is Hard to Do" was inspired by Neil Sedaka's grandchildren and is part of a CD of the same name, which features a collection of Sedaka's hits that were reinvented as children's songs. The CD was a family collaboration in which Neil's son Marc adapted four of his father's classic songs, and Neil's five year old grand-daughters made their recording debut as his backup vocalists. The song Breaking Up Is Hard To Do was first released in 1962 and quickly went to Number One on Billboard's Top 100. Sedaka re-released the song in 1975, changing it from an up-tempo tune to a ballad, and made music history when it reached #1 on the charts, becoming the first song recorded in two different versions by the same artist to reach Number One.